Welcome to the Milaca Area Chamber of Commerce! 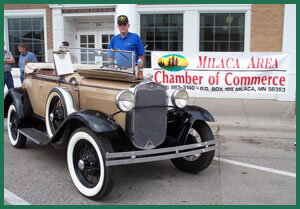 The Milaca Area Chamber of Commerce welcomes you to our area. Whether you’re a long time resident of Milaca, Minnesota or are someone contemplating a move to the area, we sincerely hope all the information found within our website will benefit you. Our Chamber is an organization made up of active and motivated volunteers committed to creating, protecting and enhancing the healthy business environment for the benefit of the Milaca area. The Milaca Chamber serves our unified and diverse members through promotion, education, information and advocacy. The members listed in the Membership Directory work hard to make this area a better place to live and work. Please support these businesses whenever possible – nothing boosts a local economy more then local residents and businesses supporting each other. The Milaca area has it all: the charm of small town Minnesota, easy access to the recreation areas of the state, and close proximity to the metropolitan area. Milaca, Minnesota is located in Mille Lacs County, at the junction of Highway 169 and Highway 23. Within 30 miles of Milaca are thousands of acres of public land, miles of trails, numerous rivers, and designated wildlife areas. The Rum River runs through the city and is an integral aspect to the city's identity. We at the Chamber hope to continue providing leadership as an advocate for the area’s entire business community and to maintain our relationships and support of the school district as well as other community organizations. We hope our involvement in local community events and projects assists in strengthening and uniting the city. Please take the time to visit Milaca and enjoy what this great area has to offer.